Yesterday and Monday I showed you how to make different modern Log Cabin blocks using Northcott’s Artisan Spirit Shimmer and Shimmer Echoes. For today’s project I’ve decided to make some placemats with these blocks. Placemats are a favorite project for me – I can try out new techniques without having to make a whole quilt, and I have something useful in the end. My local Quilt Guild supports the Meals on Wheels program in our area by donating placemats to those receiving meals. So I know that all my placemat samples will be put to good use! For my first placemat, I sewed two modern Log Cabin blocks together. Then I added 2″ strips cut from a medium gray Toscana to make the border. I did some simple straight-line quilting using a variegated black, white and gray thread. Next, I sewed on the binding cut from one of the Artisan Spirit Shimmer fabrics. 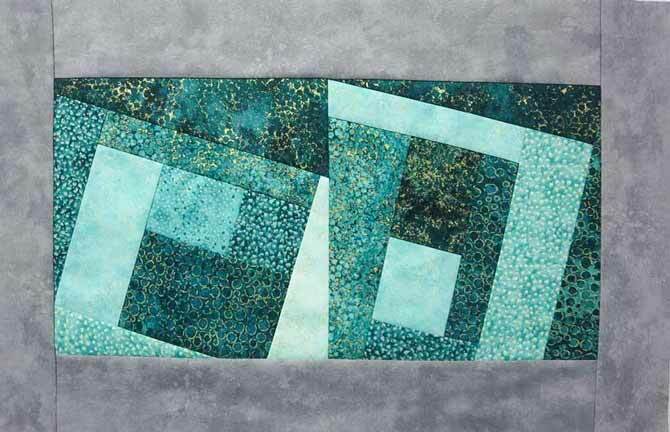 You can check out my favorite method for making and sewing on binding in this QUILTsocial blog post. Since I still had some 1½” strips left from all the blocks I’ve made this week, I decided to incorporate them into a border on another placemat. The “border” is actually the main part of this placemat, but this type of border can be used on any size of quilt. For the center part of the placemat I cut a rectangle 10½” x 4½”. 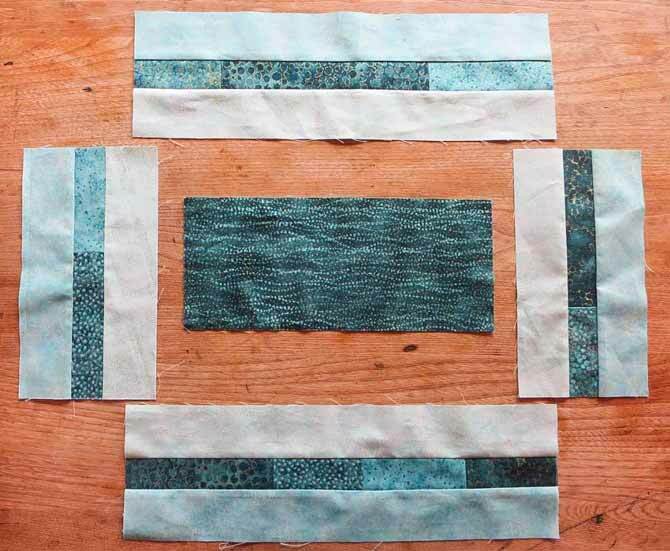 I sewed two or three short 1½” strips together, end-to-end, pressing the seams open and making a 1½” strip set for each border. Then I cut two 2″ x 15″ strips and two 2″ x 10″ strips from both a light and medium Artisan Spirit Shimmer fabric. 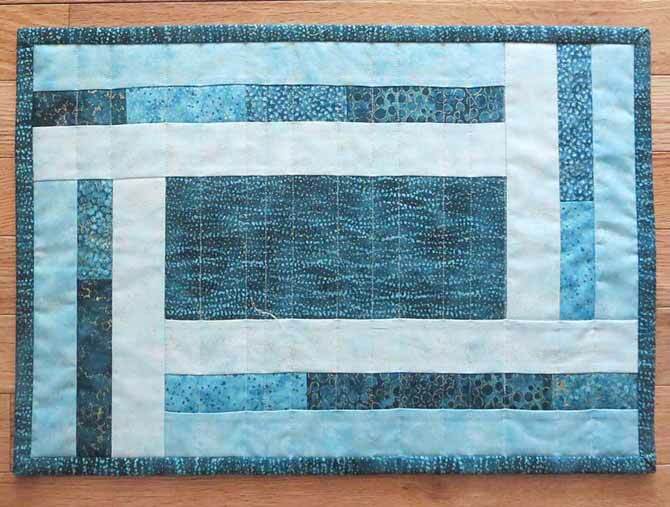 I sewed the medium and light strips to opposite sides of each pieced strip to make the 4 borders. I then trimmed the borders so I had two borders 4½” x 14½” and two borders 4½” x 8½”. 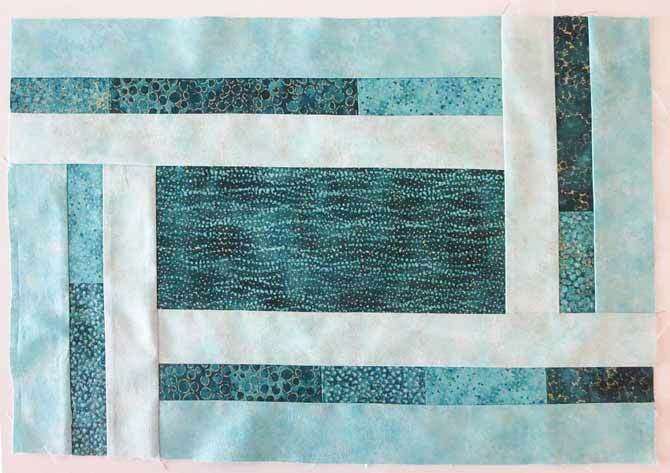 I sewed the top 14½” border to the center rectangle using a partial seam. Then I sewed on the remaining borders and then finished sewing the partial seam. And now I had another placemat all ready for quilting and binding. 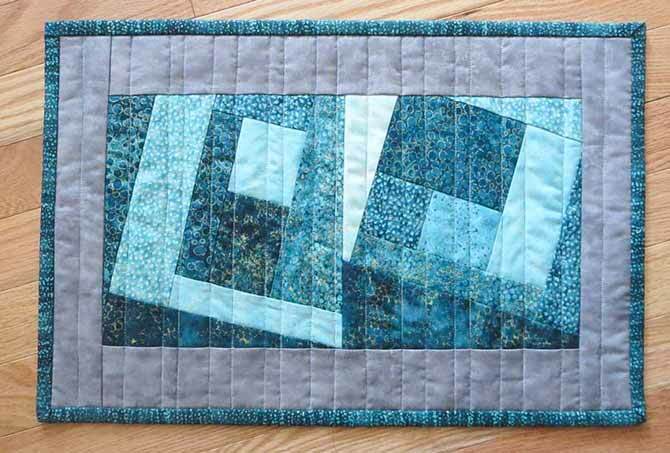 I used straight-line quilting again and one of the dark fabrics from the Artisan Spirit Shimmer collection for the binding. Here’s my finished placemat! Northcott describes their fabric as “Cotton that feels like silk” and it really is! It’s wonderful fabric to work with and is always a generous 42″ – 44″ wide. Be sure to check out this new feature on the Northcott website – The Look Book. This page lets you look at all the new fabric collections and coordinating patterns several months before they are shipped to quilt shops. Lots of time for you to plan new projects for these exciting new fabrics! 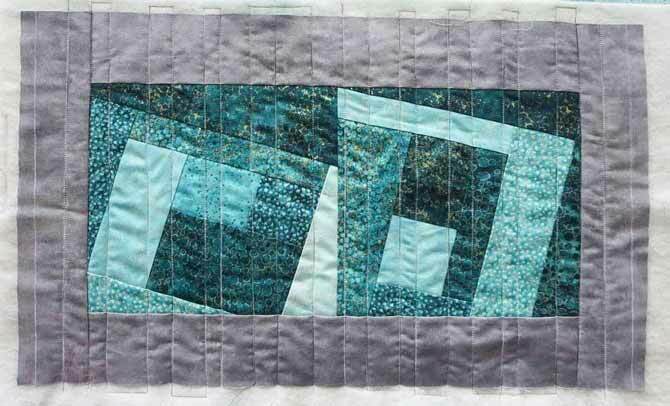 Come back tomorrow and I’ll show you how to make a small quilt using wedge-shaped strips of Artisan Spirit Shimmer fabrics.